The Answer Could Very Well Be "YES"
A lot of new tariffs have come into effect this year, and more are scheduled. These increases are substantial, and if they affect the goods your company imports, you are well aware of how this is affecting your business operations. However, there is one area that might have escaped your notice. Since your Customs Bond amount is based upon the amount of duty you pay each year, the new duties could have a tremendous impact on the size and cost of your bond. Bond amounts are required by Customs to be at least in an amount that represents 10% of the duties you will pay in a year. For most companies, the minimum bond amount of $50,000 has always been sufficient, as this was ample coverage for any importer who paid no more than $500,000 in duty over a years' time. The new duties on steel (25%) and aluminum (10%) earlier this year, followed by significant tariff actions against China (25%), have resulted in some companies paying a lot more duty than they ever have before. In some cases, these increases have resulted in the company paying more than $500,000 in duty for the very first time. 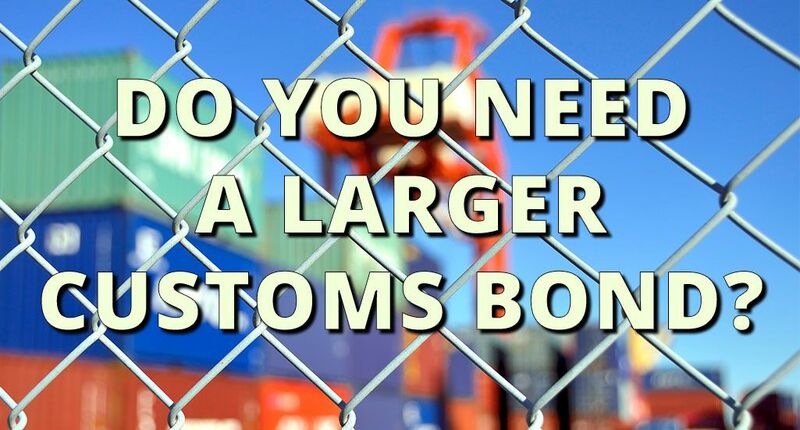 When this happens, Customs will send a notice of Bond Insufficiency to the importer (and the bonding company) advising them they must secure another, larger bond (carrying a larger premium cost) to cover the increased exposure. In most cases, once the notice has been sent, the importer has 30 days to secure the new bond. However, where the increase is substantial, Customs may require immediate action. This can have an immediate impact on your import operation since securing a new bond can take as long as two weeks to get into place. Many supply chains simply cannot afford to have this kind of disruption, so they are being forced to pay for what are known as Single Transaction Bonds for each entry. These are quite expensive relative to the use of a Continuous Bond. If you receive a Bond Insufficiency Notice from Customs, please contact your service provider immediately. It is vital that this issue be resolved as soon as possible to ensure your supply chain continues to move without any hiccups.